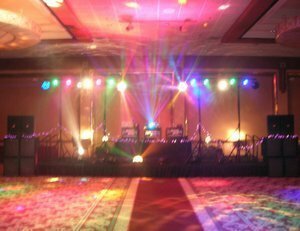 Quality Audio Productions, LLC has been consistently serving Central Missouri with premier DJ, karaoke and sound and lighting services since 1995. They have received hundreds of outstanding reviews, references and testimonials from their wedding clients as well as many corporate groups, local venues and other businesses, fraternities, schools and churches. With over 4,000 successful events, a full time on-call staff, and complete backup equipment carried for all weddings and DJ jobs, you will have the peace of mind you need and deserve for one of the most important events of your life. When you choose Quality Audio Productions to DJ and emcee your wedding you get more than just a DJ service. We help you coordinate every part of the reception and work with your photographer and caterer to make sure everything runs smoothly as well as announcing all important events, entrances and dances. Quality Audio only uses the very best state of the art JBL SRX-Crown and BOSE sound systems with new hi tech lighting featuring scanning lights, lasers, slow turning lights and mirror balls (for slow songs) and many other moving colored beam lights that run in sync with the music for an amazing dance atmosphere, but we start with the dinner music at a very low volume and adjust according to what your wedding party and the crowd want as the night progresses. You may send a list of the music you want played at your reception or just list the songs that you would like played for the special dances and we will take requests from your guests and play the dance songs that we feel will please your crowd the most. This is where our expertise and experience really shines. We have over 65,000 songs including the top 100 songs each year since 1950 and know the songs that work best for dancing from each time period. Our music and videos are legally purchased through Promo Only and converted in a loss less format to the computer for crystal clear playback. Quality Audio Productions,LLC can also provide outstanding BOSE sound and music for your wedding ceremony with condenser mics that are unobtrusive and will catch all of the vows so they can be heard by all attending. Also all extras such as wireless mics for the toast, sub woofers, lighting, karaoke, ect. are included in a very reasonable price. All of our DJs have worked exclusively for our company for over 20 years and have gained experience from hundreds if not thousands of events and Quality Audio’s owner has been in the entertaining professionally as a musician, DJ ,KJ, guitarist and sound and lighting tech since 1980 and has a vast knowledge of the POP, Rock, Country, R&B and Hip Hop music produced through the years as well as all aspects of the entertainment business. We also take pride in keeping up on all of today’s new music as many of our clients are fraternities and/or their members for weddings.